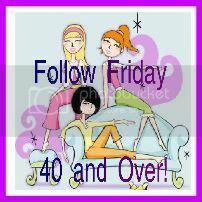 Welcome to the 69th edition of Follow Friday 40 and Over!! Hope your holidays were as fantastic as mine were. Now I need to gt over this bronchial pneumonia and I'll be fine. YUK! Oh boy, just to medicine & the eyes are closing already. HI JAVA & HAPPY NEW YEAR TO YOU & YOURS! Hope all your wishes came true & family is happy! Have a great weekend. I wish you & yours nothing but joy & happiness & health, love & prosperity for the upcoming year. Oooh, just found Vanessa Morgan - lovely blog - have RSS followed so I can read again! Thanks for the link. Have a great weekend!! thank you for hosting thiis fun hop!!! Thanks so much for hosting! I am 59...have 11 grandkids, 2 greats and one more on the way. I think and live young...too much to enjoy to slow down! Would LOVE it if you'd follow back, LIKE my FB page and definitely visit us at Ducks 'n a Row on Wonderful Wednesdays for our weekly HOP! I've been looking through your blog (it's fabulous, I love your attitude to being 40+!!) and was wondering if I can join as I'm 39 and a half... I started my blog in July '11 as a countdown to my fortieth! I love participating in links parties - would you be happy if I joined? Thanks for hosting Java! I wanted to personally invite you to the launch of Friendship Friday - please stop by and share what you love most about blogging! Hi Hope things are going along fine & I can't wait to see your changes you spoke of. Have a great weekend. Just trying to get through your old list here to keep up with the blog hop. Take care. Just peeking around to see if you had one this week. You're probably just busy, but I wanted to say have a nice weekend. I'm a new follower. I just turned 41 and love your blog theme! Great idea, love your blog title sooo much. It is actually how I feel. Coming to you from Blogelina, I'm new and well over 40. Looking forward to meeting some new friends. Thanks for hosting. Thanks for hosting this Java it makes us bloggers starting out more productive and feel connected to so many more friends then we could possibly imagine. I am a follower and added your buttons to my page hope to have you follow back. Have a blessed day "."